Want to earn a million dollars more? Why should you go to college? While there are many potential benefits of a college experience, one of the most obvious and tangible reasons to attend college is what happens after graduation—in other words, how attending college affects a person’s career path and earning potential. Using the measure of earning potential, the evidence is clear that college is a smart investment. Not only are people with a Bachelor’s Degree more likely to be employed, they also make more on average over a lifetime of working. Pulled from data provided by the Bureau of Labor Statistics, the graph below illustrates how people with different levels of education have fared since the recession began in 2008. 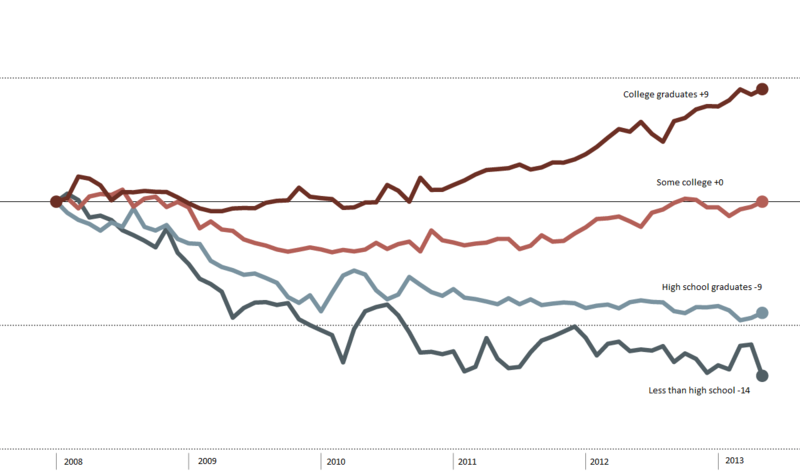 The top line represents a 9 percentage point increase in employment for people with college degrees. By contrast, the bottom line represents a 14 percent decrease in employment for those with less than a high school diploma. People with a high school diploma are 9 percent less likely to be employed now than in 2008. Clearly, those with a college degree are faring better, even in a difficult economic environment. In fact, the New York Times reports that the unemployment rate for people with a college degree is only 3.9%, compared to 7.5% for the workforce as a whole. Split by education level, college graduates are the only group more likely to be employed in 2013 than they were in 2008. Not only are college graduates more likely to have jobs, they also make more on average over a lifetime of working, no matter the field that the graduate chooses after completing college. In 2012, the average full-time worker with a Bachelor’s Degree made 79% more than the average full-time worker with a high school degree. Even after factoring in the money lost while students are not working, the return on investment for a college degree is 15.2% annually, a rate five times higher than the returns on home ownership. This graph from a study of lifetime earnings done by the Georgetown University Center on Education and the Workforce illustrates the median lifetime earnings broken out by level of education attained. 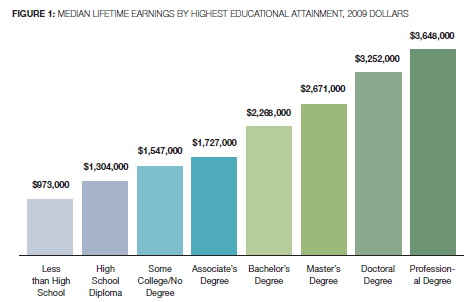 People with a Bachelor’s Degree earn about a million dollars more over a lifetime compared with those who have only completed a high school degree. While there is a large jump between the median amount earned by holders of Associate’s and Bachelor’s Degrees, even attending some college increases lifetime earnings. So yes, even if the upfront costs seem like too big a hurdle, a college choice that is smart both financially and personally is worth balanced borrowing. Does the college have a career office? What internship, job shadowing, or other career preparation programs are available for students? How does the university support preparation for my career interests? Work experiences aligned with a rigorous academic experience will best prepare you for career success. Are there other resources available for conducting a job search, such as guidance on writing a resume or cover letter or perfecting interviewing skills? What organizations and companies recruit on campus or participate in on-campus job fairs? Does the college have a strong alumni network? Do alumni participate in career exploration programs through the college? What do students do after graduation? What percentage were employed, versus pursuing further study, doing volunteer work, or joining the military? What are students doing one year, five years, and ten years after graduation? Try this Experiment: Go to the sample Career Services sites below of schools that will attend the June 15th DCPS College Readiness Workshop. How many of the questions above you can answer using their website? Have more questions about lifetime earnings of college graduates? Leave us a comment here or send us an email at dcpscollegereadiness@dc.gov.